After the hair regrowth and and self flagellation with brambles, the next stage in turning myself back into a mountain biker was to reacquaint myself with how to ride off road without hitting trees at regular intervals. Part II involved a decent ride somewhere new - although when I got there I realised I'd actually done some of the route before - sort of like deja vu, but with a sprinkling of reality. 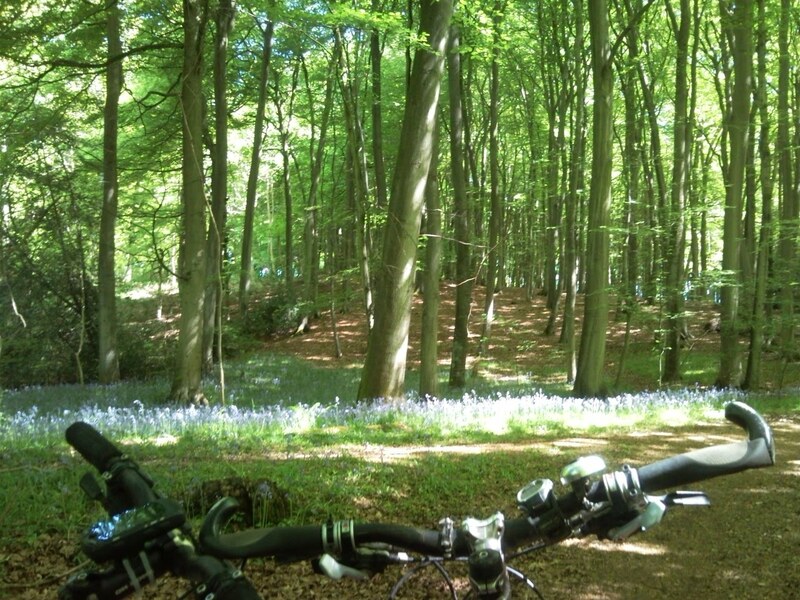 Caroline and I went to the south Chilterns (or near Pangbourne for those who navigate by towns) and did the route from an organised ride a few weeks before. It was stunning. Hot, bluebelly (i.e. 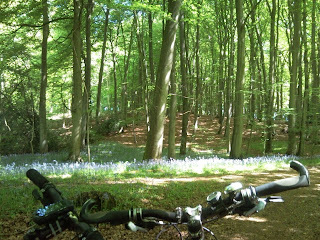 there were lots of bluebells. Not that we had smurf stomachs), dry, dusty. One spot was breathtaking - the camera phone picture really doesn't do it justice. Part III was something that's been arranged for a while - an afternoon for Caroline, Jon and I with Tony from UK Bike Skills. The idea was to have some fairly personal skills coaching, and Tony came highly recommended. Tony has such a calm, relaxed, intuitive coaching style - he can pick up on the smallest thing, suggest a correction and suddenly you find things so much easier. When you are riding well everything flows, everything is effortless and there is a connection to the bike and trail. At least, that's how it was for Tony. For us, things were a little more, um.... patchy. Certainly at the start our feet were wrong, our wrists and heels were wrong, our vision was wrong... and Jon nearly fell off in the first 10 seconds of riding around a stick. However, with a few pointers we got better. We pumped, we dropped, we climbed, we cornered, we strung sections of trail together. We had gone from a dribble to definite signs of flow by the end. And I didn't hit a single tree.